First, we're doing a Timelapse Monitoring Kit workshop to help create a kit to monitor polluters -- to catch them on film! -- in collaboration with a number of other local groups around the country who are already beginning to use them. We'll need all sorts of skills, so please write back if you can join us! In natural emergencies like hurricanes or floods, emergency response centers provide food, shelter, and healing. Social Emergency Response Centers (SERCs) re-imagine these centers to take on the real and pressing social emergency that we are facing today. They help us pivot out of humdrum time, through despair, rage and hopelessness into collective, creative and radical action. 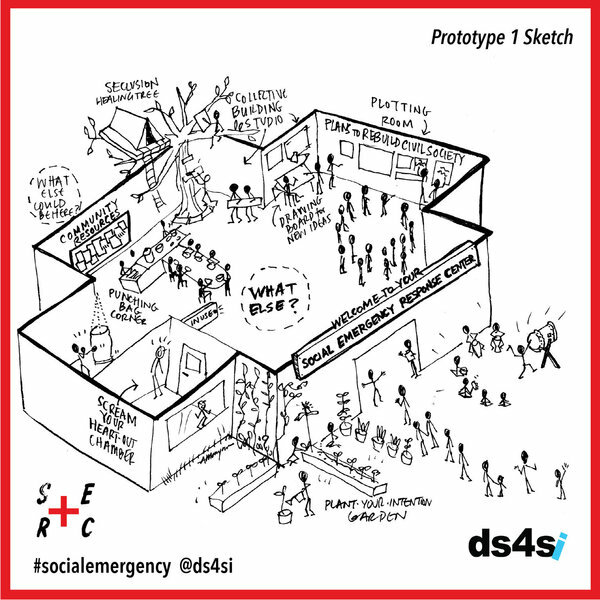 from DS4SI: SERCS are temporary, emergent, and creative pop-up spaces co-led by activists and artists around the US. They include creative action, healing, collective making, performances and more. We have witnessed and experienced the effects of state sanctioned violence, gentrification, privatization, Dakota Access Pipeline, 'Trumped-Up' Isms, Flint Water Crisis, and other crises that constitute a social emergency to different degrees. We will need to figure out the balance, like how will we feed people--and their hunger for justice? How will we create a shelter--where it's safe to bring your whole damn self. Interested in being a part of this here in Somerville? Run a workshop. Workshops are food for the brain, body, or soul, and can be on anything from screenprinting to Standing Rock, decompression strategies to anti-displacement. What do you want to learn? What do you want to share? Build a cohort. This is an opportunity for us to strengthen our collaboration muscles and build a cohort of people -- Somervillians, artists, old timers, crafty folks, educators, hipsters, and activists of all stripes -- to reach across boundaries and help to lift each other up. We need each other now more than ever! Intergenerational. If you've been around the block and have seen all this a million times -- or if you're just-recently-not-a-kid and are terrified out of your mind - we want your perspective and your voice. CITS, Full Circle cohort, youth leaders, and youth organizers: you especially are invited! And - hopefully - multilingual. March 18 is a quick turnaround time for translation, but we are excited and eager to get it in place for May. For either date we are excited about running workshops in languages other than English. Do you have an idea for a workshop you'd like to run? Let us know! Somerville local (and Cambridge, and Medford, and Arlington, you too!) Strategies for creative resistance, anti-engagement, grassroots mobilization, and DIY organizing have been happening right here for decades.